ROMANS 12:14 KJV "Bless them which persecute you: bless, and curse not." 11Not slothful in business; fervent in spirit; serving the Lord; 12Rejoicing in hope; patient in tribulation; continuing instant in prayer; 13Distributing to the necessity of saints; given to hospitality. 14Bless them which persecute you: bless, and curse not. 15Rejoice with them that do rejoice, and weep with them that weep. 16Be of the same mind one toward another. Mind not high things, but condescend to men of low estate. Be not wise in your own conceits. 17Recompense to no man evil for evil. Provide things honest in the sight of all men. Blesse them which persecute you, blesse, and curse not. Bless them that persecute you; bless, and curse not. Give blessing and not curses to those who are cruel to you. Bless them who persecute you; bless, and curse not. Invoke blessings on your persecutors--blessings, not curses. 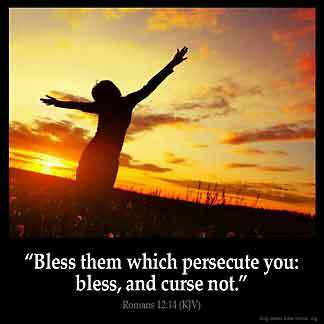 Bless those who persecute you; bless, and don't curse. 12:14 Curse not - No, not in your heart. Ro 12:14 Bless them which persecute you. See Mt 5:44. Thus did Christ on the cross (Lu 23:34), and the martyred Stephen (Ac 7:60). He who can obey this precept is a transformed man. David was a man after God 's own heart and all the while that Saul was cursing David and threatening to kill him : David continued to Bless Saul because he Saul was God 's anointed : Even so should I : even if that person is not of God : I am to Bless and curse not !!! I do not believe in getting even because I would be allowing myself to be in the same state of mind as they. To curse and swear. God called me to go up and be in His standard of living !!!! Yes,we should bless them,coz our GOD will take revenge on our behalf.